Today is the bicentenary of the birth of Nikolai Gogol (1809-1852), who was one of greatest and strangest writers to come out of Russia or Ukraine, and deserves considerably more fame than he has in Britain. Gogol was born in the town of Poltava in present-day Ukraine, and many of his earlier stories were based on gobbets of Ukrainian folklore supplied by his mother along with financial support. Naturally, there has been a lot of wrangling between Ukraine and Russia over his true nationality since he wrote in Russian and lived for a considerable while in St Petersburg. I was first put off reading Gogol at the age of 17 by a nasty Penguin cover for Dead Souls depicting a bunch of peasants grubbing around in filth (at least that’s how my memory has repainted something by Repin), and didn’t actually start reading his work until several years later. That picture was wholly inappropriate to Gogol, whose genius lies in his humour, his ability to get hopelessly and wonderfully distracted by details, and his utterly bizarre vision of the world. One day during a visit to St Petersburg, I decided to locate a memorial to Major Kovalyov's nose which had been installed in 2002 on the wall of Prospekt Rimskovo-Korsakova, peering over a set of traffic lights. I was galled to find that the organ in question – which weighed in at a good six poods and was positioned several metres above the ground – was simply absent. I checked and rechecked the address – it was correct. I approached a somnolent security guard working in a nearby bank and explained everything to him; his look was as blank as the wall. I didn’t know what to do, I’d walked a long way to get to that nose, I hesitated. And then, abruptly and unpleasantly, before turning back to the little TV flickering in the plastic booth: no, he had no recollection of any nose, there’s no nose here. The fact was, the nose simply vanished one morning. Perhaps it was taken by thieves, perhaps it sauntered off to a cushy job in GazProm where it was something of a hit with the ladies and liked to read trashy magazines. Congratulations on the Gogol blogs – very interesting. According to http://www.spbin.ru/encyclopedia/monuments_small/nose.htm, the nose was installed in 1995. It did indeed go missing in 2002 - apparently, the marble bas-relief was stolen and found in a nearby block of flats a year later. The stary nose was put back on the wall of 11 Voznesensky prospekt (fixed properly this time) and has been there ever since. 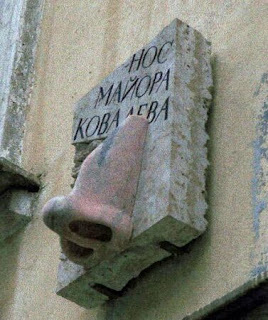 This article tells me that in fact I have been spoiled rotten for monuments to Kovalyov's nose, all of which I have missed somehow: there's another in the University of St Petersburg and even one in Kyiv (where I even lived for two years) on Andrivskiy Spusk. Shocking. As for the missed opportunities, I'm sure there'll be other occasions and possibly other noses.